By allowing them to build detailed blueprints, Lucidchart helps the Creation Agency show clients the value of their B2B marketing services and to carry out campaigns. 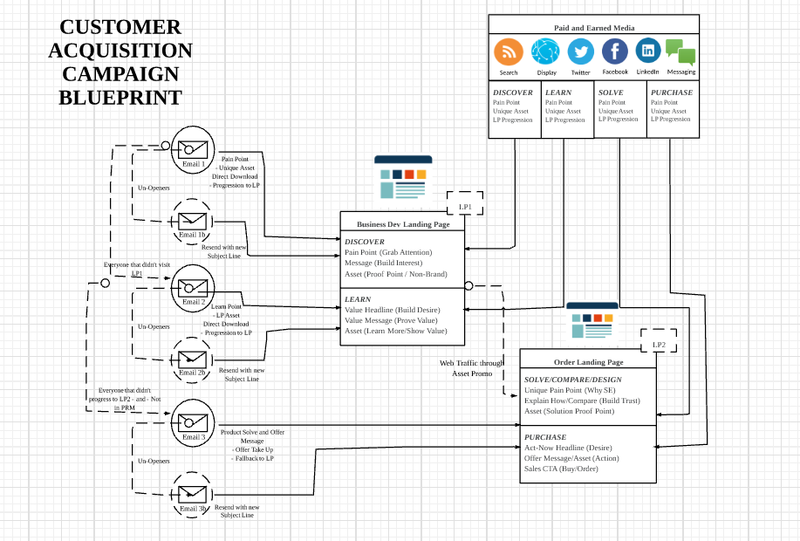 The Creation Agency uses Lucidchart to create blueprints, which show prospects the complexity of the campaign without going too deep in the weeds. The team has saved at least 50 hours of work per project when they refer to previously created blueprints. The blueprints help Creation remember what was worked successfully in the past and onboard new employees. Lucidchart's intuitive interface allows the team to work quickly on proposals, which is especially important because it falls on a few people to make the majority of sales calls at this small agency. Creation's global CEO and the CEO of the U.S. division live in different countries. After phone calls, they map out their ideas in Lucidchart to make sure they're on the same page. The Creation Agency runs “the engine of marketing” for a variety of B2B companies, including HP, Samsung, IBM, and other brands in the Fortune 500. Among their services, the Creation Agency maintains social channels, manages email campaigns, creates lead generation campaigns, and builds websites. Even if you haven’t heard of the Creation Agency, you have likely seen the impact of their work. The Creation Agency runs “the engine of marketing” for a variety of B2B companies, including HP, Samsung, IBM, and other brands in the Fortune 500. They maintain social channels, manage email campaigns, create lead generation campaigns, build websites—anything related to B2B marketing. And since its start in 2002, the company has added an office in Scottsdale, Arizona to its headquarters in Buckinghamshire, England. But you don’t attract Fortune 500 companies and expand globally without first convincing potential clients of the value you can provide and then delivering on that value. 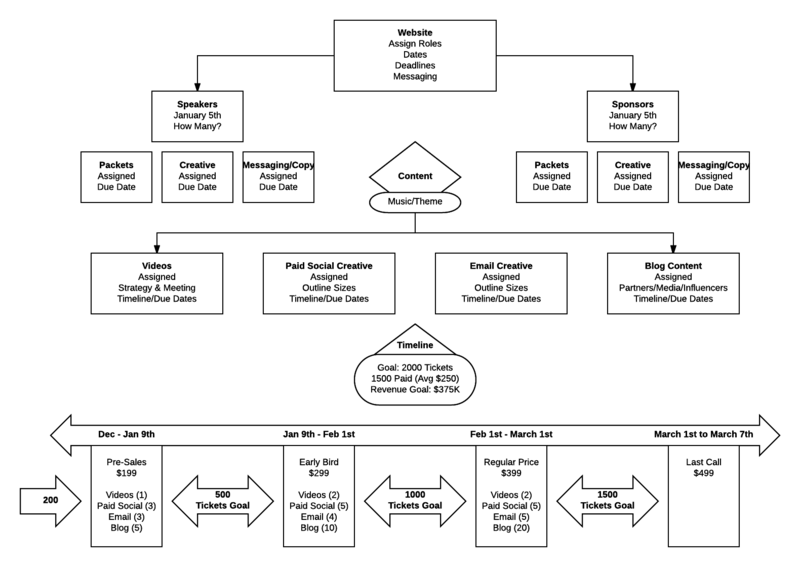 The Creation Agency achieves both through visual communication in Lucidchart. Even when you’ve worked with recognizable brands, running a full-service digital agency still comes with a lot of pressure—the personalized attention that the Creation Agency gives to their clients and campaigns isn’t cheap. The company needs to prove its worth right off the bat, and they’ve repeatedly done so using blueprints. Click for a larger view or start your own blueprint in Lucidchart! Essentially, Jack and his colleagues simplify the entire campaign into one image. This particular example shows all the facets of an email marketing campaign: what materials are included with each email, how the emails all feed into one landing page, etc. You may remember your high school English teacher telling you that the key to powerful writing is to “show, not tell.” It turns out that “showing” is the key to winning clients as well. Once they have sold their marketing services, the Creation Agency has to deliver a winning campaign. Over and over again. These blueprints fit the culture of the Creation Agency perfectly. The agency world experiences a lot of turnover, so they can use blueprints as part of onboarding. Plus, agencies will often sell a service that they don’t perform again for years—the blueprints give enough context for the marketers to get started again. Jack and Jason Burrows, Co-Founder and Global CEO of the Creation Agency, both understand the power of a blueprint, but due to the current size of the company, they make 80 to 90% of the sales calls, and therefore, they create 80 to 90% of the blueprints. With all of the responsibilities on their plates, Jack and Jason need to work fast and remain efficient. Previous methods required too much effort. Jack drew his blueprints by hand, and Jason tried software that either wasn’t designed for blueprints, such as PowerPoint, or was too complex and meant for high-fidelity design work. Neither of these men are graphic designers, and they don’t exactly have the time to become one. Few employees can use other tools with limited experience. Anyone can use Lucidchart. Because Lucidchart has been so simple to use, the Creation Agency has started using it to visualize other work. For example, the agency is currently building a new website, and after Jack and Jason meet about the website, they turn to Lucidchart to not only map out their ideas for the web developers but to make sure they understood each other when they can’t speak face-to-face. In Lucidchart, Jack, Jason, and their ever-growing number of employees can quickly visualize campaigns, close deals, and maximize efficiency. And they aren’t the only ones. According to Lucidchart users across industries, Lucidchart increases productivity by 38%. See how Lucidchart can impact your entire company—try it today. Show the value of your services using Lucidchart!